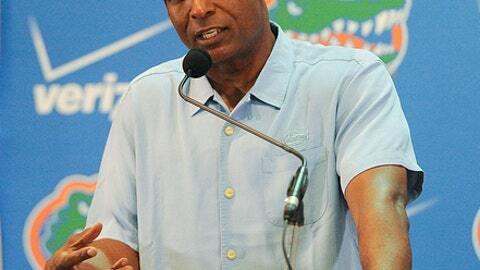 GAINESVILLE, Fla. (AP) Randy Shannon is shaking things up as Florida’s interim coach. The former Miami coach replaced Jim McElwain on Sunday and needed less than a day to make changes. ”I don’t look at it as an audition,” Shannon said. ”I just think the opportunity to coach and have fun with a bunch of guys, the student-athletes that you have a chance to be with. … We’ve got to go out there as a whole team and unit and coaching staff and have fun with these guys, be very enthusiastic, be very positive and whatever happens in the game early, we’ve got to weather the storm. Florida and McElwain parted ways after two-plus tenuous seasons and a tumultuous week that ended with a third consecutive loss . Athletic director Scott Stricklin asked Shannon to take over, knowing he would make adjustments that could spark the Gators (3-4, 3-3 Southeastern Conference) down the stretch. Florida plays at Missouri (3-5, 0-4) on Saturday. McElwain returned to campus Monday and said goodbye to players at the end of practice. ”He still has love for us, and if you need him, he’s there,” Dawson said. Players said they have little choice but to regroup and move forward with Shannon. One thing he didn’t do was make radical adjustments to a lackluster offense that ranks 112th in the nation. He even stuck with embattled coordinator Doug Nussmeier as play-caller. ”As a head coach, I’ve got to be able to multitask on offense, defense, special teams,” he said. Franks has been benched in three of his six starts. He has completed 60 percent of his passes for 830 yards, with four touchdowns and four interceptions. He has been sacked 19 times, including five in each of the last three games. Zaire, a graduate transfer, has completed 12 of 23 passes for 142 yards in two mop-up appearances. The Gators hope to get more with Shannon in charge. But what he does during his four-game stint as interim coach might not matter in Florida’s coaching search. Shannon said that’s fine with him. He didn’t even talk to Stricklin about being the team’s next permanent coach.